If you’ve been thinking about investing but you haven’t started yet, don’t put it off any longer. Putting money aside into investments can provide you with added income for retirement in the future. Plus, of course, the sooner you start, the sooner you can take advantage of compounding interest. Furthermore, the idea that investments are too risky might be holding you back when in reality, they can hold the potential to help build your wealth if you educate yourself about them prior to getting started. If you are thinking about getting started investing, here two vehicles to help you kickstart the process. Many employers offer a 401K plan, so if yours does, too, you should consider taking advantage of it. But like any investment, you need to know what you are getting into before you sign up. When you sign up for a 401K plan, your employer will ask what percentage, or dollar amount, of your paycheck you want to contribute. This percentage is held out from each paycheck, before taxes unless you elect to sign up for a Roth plan, and deposited into an account on your behalf. Additionally, some employers will also contribute to your account up to a certain percentage to “match” your contributions. This will help your account grow faster, so if this benefit is offered, you should take it. A nice feature of these accounts is that you get to decide how that money is invested, but there are usually fewer options than an IRA. This gives you control over your investment growth and risk, but makes it easy for beginners as they are less likely to be overwhelmed with too many choices. When choosing an investment strategy, it is generally recommended to diversify by placing some of your money into higher-risk, higher-return investments and some into lower-risk, lower-return investments. The idea is that when one investment experiences losses, another might still be gaining so your investment continues to grow. This is also why some people choose to invest in index funds and utilize the best investing software. Opening a brokerage account through a company such as Prudential or Vanguard, or many others, will allow you to invest in mutual funds. Mutual funds are made up of a group of funds from many investors who invest in stocks, bonds, and other assets. The goal is to produce capital gains and income for those who invest in the mutual fund. The advantage of choosing mutual funds as a beginning investor is that you don’t have to invest large sums of money. In fact, some companies allow you to open an account with as little as $500. Plus, any gains or losses in the funds are shared among all of the investors so the risk is lower than some other investment options. If you are considering opening such an account, make sure to ask about the associated fees so you don’t have any unexpected bills eating up your gains. Investing in your future is a great thing to do. Don’t be shy if you are a beginner; even the most seasoned investors were beginners at some point, so you shouldn’t be afraid to ask questions. The best thing you can do before buying into any type of investment is to learn about it by reading and asking questions so you know exactly how the investment works and what to expect. 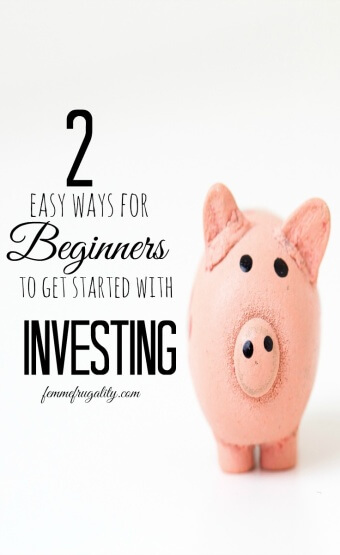 Do you have any tips for beginners looking to get started investing? This post is contributed by Kayla, a personal finance blogger in her mid-20s who loves to write about money topics of all kinds. This entry was posted in Money Management, Ways to Save Money on June 15, 2016 by femmefrugality. Open your IRA! Don’t waste any time, even if you only put in a teeny bit each month. It’ll compound into something. We’re going to try to max out a SEP this year or next year. Probably next year, but we’ll see. Once that’s clipping along, I probably should get going on a mutual fund — in addition to our copious other goals. Sigh. SEP and IRA are my favorites lately, too! Another trick to get over that initial cost hurdle is to use a windfall or non-standard income to open your accounts. For instance, i used my income tax refund to open my initial IRA. The next year, I used the income tax refund to reach the minimum in a different mutual fund. You could also use your annual bonus if you get one, or a third check of the month if you get paid every other week. Love it! These are two ways to get started, but definitely not the only two ways!